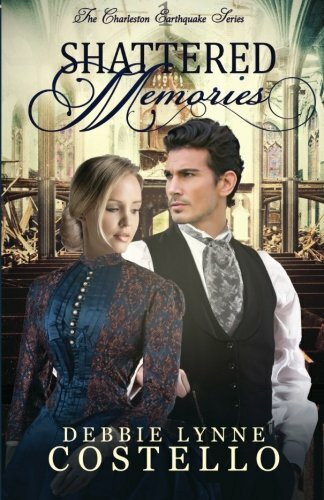 Shattered Memories by Debbie Lynn Costello is a Christian historical thriller set in 1886 in the aftermath of the Charleston earthquake. There are many themes running throughout the novel and one of them is that of searching, literally, spiritually and mentally. There is a searching for an account book, a searching for God and a searching for memory. It almost seems the harder one searches, the more elusive whatever one is searching for becomes. Sometimes one has to relax and let go, in order to let the memories flow. Both main characters, Drew and Olivia feel that God is distant. Drew even cries out “God where are you?” God in His silence seems to have abandoned them, but silence does not mean absence. Drew likes to be in control. He is a doctor and used to fixing things. He tries to fix Olivia’s memory but nothing seems to be working. Drew’s father wisely tells him “You need to turn this burden over to the Lord.” Drew, like many of us, has difficulty leaving things in God’s hands. He definitely has trust issues. “He wanted to be the one in charge of his destiny rather than God. Trust left him feeling too vulnerable.” If Drew cannot trust God, then he is not exercising his faith muscles. He needs to let go and let God. Olivia too has issues with faith and trust. She believes that she is too bad for God and she doubts His love for her. She is listening to Satan’s lies that are raging in her head. The reader is reminded that life is a spiritual battle and as such we need to be armed with God’s word. Olivia thinks that God is far from her, “she didn’t have the faith to believe that God still cared.” Olivia is standing on her own feet and trying to work her way into heaven. She needs to hand the reins of her life over to God. I am sure that many of us can empathise with her. The theme of hospitality is present within the novel as Drew’s family open up their home to earthquake victims, both people and animals. This reminds the reader that God cares for all creatures great and small. The novel demonstrates that God’s power works best in our weakness. Sometimes all we can do is give it to God and pray. God’s power is made perfect in our weakness. I really enjoyed Shattered Memories. It had me on the edge of my seat at times. The ‘baddies’ were so well drawn that I found myself sneering as I read about them! Drew and Olivia were both loveable main characters. As a reader I felt Drew’s pain when He felt helpless in situations. And I empathised with Olivia’s vulnerability. I am really looking forward to the next book in the series. I am looking forward to book 2 also! Thanks Debbie! I’m so glad you enjoyed SM! 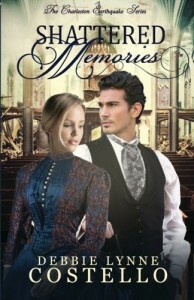 Julia, thanks for a great review of Shattered Memories. From your review it sounds like readers can learn some lessons about trusting God as the characters did. I’m looking forward to reading this book. Hey Debbie, I’m so glad you liked it so much you are looking forward to book 2! What an inspiration for me. God bless! Julia, Thank you for sharing your review of Shattered Memories. Sounds like the characters realized God was their answer and I’m sure this book will be an encouragement to readers. I enjoy reading inspirational historical books. Marilyn. Thanks for coming by. Drew and Olivia have some eye opening experiences that draw them closer to our Lord and Savior. Awe thanks Carly! I appreciate you sharing. Thank you for your lovely review, it was one of the most enjoyable to read. I’ve enjoyed following the blog hop and learning more about this book that I’ve put on my MUST-READ list….lol! I loved this review!!! It makes me want to read my book! Lol. Julia did a beautiful summary and shared the spiritual side wonderfully. Thank you , Julia. Thanks for following the tour, Linda! It’s great to see you here. And thanks for being a FB follower!